A hunting party sets out on horseback against a creamy pastel landscape in this beautiful large work from Mstera. The sky glows with the soft peach tones of dawn as they search out the perfect spot. Each has an elegant falcon, to flush out the prey. The two nearest talk amongst themselves, perhaps boasting of the superiority of their birds' training. 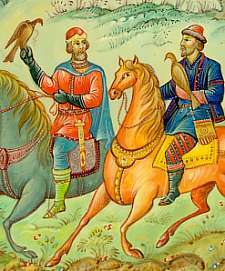 The third is content to let his skill speak for itself, and he prepares to loose his falcon on an unseen hare as his horse thunders through the brush. The scene is nicely done, with the colors crisp and bold. 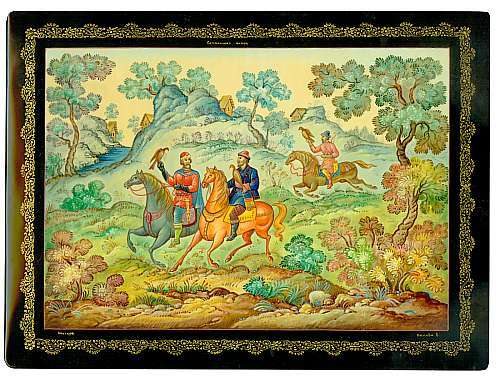 This box is made of high quality papier mache and is signed on the lid with the artist's name (E. Panova) and village. There is a hinge at the top, and the interior is red lacquer. It rests on four round legs. A charming folk scene.